New England Patriots quarterback Tom Brady, a five-time Super Bowl champion on a promotional tour in Asia, says he hopes to play a National Football League game in China before his career ends. Brady, a four-time Super Bowl MVP, rallied the Patriots to a stunning comeback victory over the Atlanta Falcons last February to win Super Bowl 51. The 39-year-old signal caller was set to play a preseason contest with the Patriots in China in 2007, a year before Beijing hosted the Olympics, but the game against the Seattle Seahawks was canceled by the NFL in order to focus on the debut of regular-season games in London later that year. “My dream is to play a game here in China someday,” he told ESPN. “We had an opportunity, I think, 10 years ago and my team was going to play here, and unfortunately it didn’t work out. 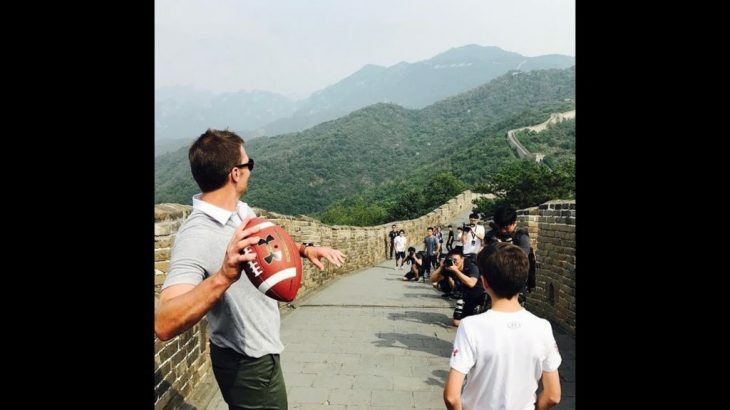 Brady, who turns 40 in August before the start of his 18th NFL campaign, posted an Instagram photo of him throwing an American football while on the walkway atop the Great Wall of China in Beijing on Sunday. His trip, for sports clothing maker Under Armour, included stops in Shanghai, where he held a promotional training event yesterday and Tokyo today. “I am excited about the opportunity to be able to connect with the people in China and Japan, experience the incredible culture and share my love for the game with my fans,” he said. Entertainment, Translations Tom Brady. permalink. This guy is a living legend!